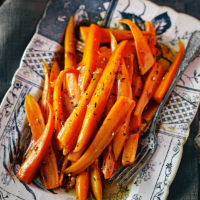 Honey and butter not only bring out the natural sweetness of the carrots (the cumin adds just a subtle hint of spice), they also give them a lovely, shiny glaze. 1 Add the carrots to a pan of boiling salted water and simmer for 4-6 minutes, or until just tender. Drain well and rinse under cold water until cool; set aside until needed. 2 When you’re ready to serve, melt the honey and butter in a pan, toss with the carrots and cumin seeds and season. Cook over a medium heat for 3-4 minutes, until soft and caramelised, adding a splash of water if needed to make sure they’re coated nicely. Serve immediately.